This is a book authored by Priya Kumar, an internationally acclaimed author and a motivational speaker. I am thankful to Priya Kumar's team for sending me a review copy. This book is about Arjun who has a wrecked personal and professional life. While he is on the verge of getting divorced, Arjun took a trip to the Himalayas to reach Hemkund Sahib pilgrimage on insistence of a sadhu. That is when he had a fantasized journey leading him to find his true calling, and hence, a respite from the ruined relationship. 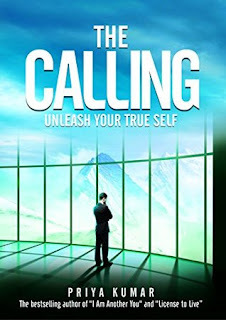 The book reminds me of The Monk Who Sold His Ferrari by Robin Sharma, which was also based on the theme of self-actualization during a trip to Himalayas. With distinct way of story telling and conveying the message in an unusual style, Priya Kumar uses her imagination in an amazing manner to pen down the plot. It consists of light hearted spirituality, a whole lot of contemporary world's life lessons and a pinch of comedy. Its an unconventional style of sharing the message of finding one's calling. Flawlessly narrated, never before heard kind of plot, carved out of marvelous imagination is what the author does with this 160 pager book! However, a couple of things could have been different. One of them is, at places, certain points are elongated which could have otherwise been crisp and short. Secondly, the happy ending only comprises of the change that Arjun's personal life undergoes, but nothing on the professional front. My rating for this book is 3.5 on 5.